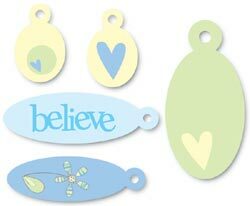 Heidi Grace Pocket Charms - Believe. Use these colorful coordinating embellishments to create fun and unique ATCs, scrapbook pages, craft projects and personalized gifts. Simply attach the see-thru charm by threading Irish Waxed Linen through the hole, fancy fibers, twine, ribbon etc.